I know he has a grievance against the team. Anyway he comes back if healthy? Put me down for Chris Conley in free agency. Loved him coming out of the draft. He's been more of a afterthought in KC. Funny guy good character team first guy. He could do well in New England we could pry get him for 4 mill or so. Have we not been reminded how important the slot receiver is to the Patriots’ passing game and to Tom Brady in particular? It’s the most important position especially if #87 should retire or continue to diminish in impact. Having a player whom Brady already trusts implicitly to share that position with #11 or be a reliable backup would be invaluable. During one of Super Bowl media show, Amendola showed his love for Adam Case and also referred to Jamal Adams as a teammate. Not only has it sailed, it's taking on water and the captain forgot the lifejackets. We are well overdue for an acorn. Ewww I would really hate him as a Jet. If he wants to make a impact Green Bay Niners or Chiefs. Who love to see Amendola back, but not sure what he has left in the tank. Perhaps we could pace him till the playoffs. agreed. Good player. Conley, rookie and Edelman could work. Yeah, I am thinking there is little chance that he comes back to Foxboro. I see nothing wrong with what Amendola said. People were probably asking him the difference between playing for Belichick and Case constantly. Adam Case was his new coach and he was putting positive vibes out there. The piece even says that Amendola called Belichick, "the greatest coach of all time." Isn't that a better compliment than being his pal? The piece was complete spin and BB would know this. That doesn't mean Danny is coming back, but it has little to do with anyone's decision. Bill wouldn't care anyways, he's pretty consistently shown he holds no grudges. He'd bring Dola back if it made sense even if Dola called him an *******. Assuming he wants to come back, it would be great to add him. 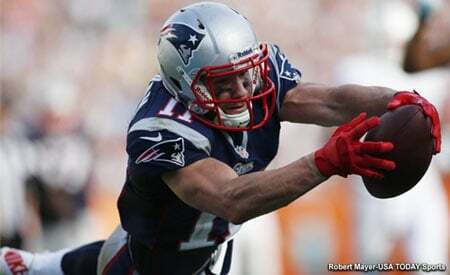 Right now the only WR we have signed is Edelman. Hogan, Patterson, and Dorsett might all be gone, so we could use the continuity of someone that knows the system. Get Adam Humphries who was held back by inconsistent QB play he would flourish in a stable setting like ours. I would let Trent Brown walk Sign Flowers and Adam Humphries. Having WR Adam Humphries > retaining Trent Brown. I don't think it's going to happen, nor should it. Like others have said, the focus should be on WR1 and WR2. Man would I love it if Gordon comes back (and stays). I meant it as an indication that Danny preferred the environment in Miami (and maybe Rutherford soon?) to Foxboro.